It is planned to be used for practical skills of Type 2 electrical worker at the end of this year. Although I might not use it because I already bought a stripper, I can not keep it, I do not have to be stranded. This review is about item#6725686. Although I have few opportunities to use it easily, I put one in the waist bag as an amulet. Sharpness is a passing point. Although it is a bit deductible that the quality of wooden grip is disappointing, it is a good feeling if it can be used if it is hard to put in and out of the blade out of the new item. But after all, there are few opportunities to use in electrical construction at this time. Denki knife which I have been using for nearly 40 years soon began to be renewed because of its lifespan (due to sharpening too much and the cutting edge has become thinner ...). Sharpness and usability are also good. 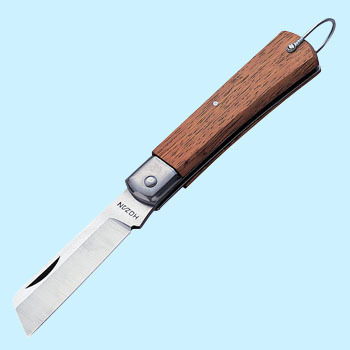 It is a stable Hausan Electric Work Knife. Although it was peeling with a cutter knife so far, the blade hits until the wire covering, and often it cuts. It is a fluff brush knife. I feel good peeling. I am using it for purposes other than Electric Works, but it is convenient. I was stripping the vinyl with a cutter knife until I pulled the copper wire from the vinyl code of the electric product, but efficiency was improved by using this. Hawaiian knife is this price. I appreciate it. It is saved more cheaply than mass merchandisers. This review is about item#06725686. It is an old-fashioned knife familiar. It is used for the work of children. In and out is hard. The blade does not fit completely. It is impossible for children to use for purpose of use. Just a good size to fit in your hands. It can be used with confidence without grafting. The hardness at the time of storage gets used while using it.